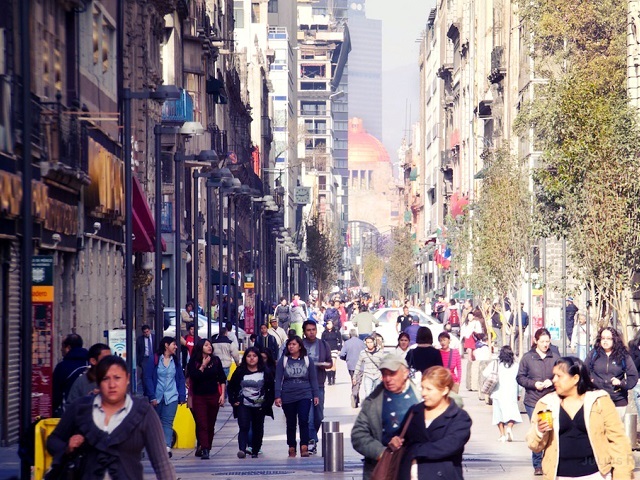 Mixed-use development combined with pedestrianization on Mexico City’s Calle Madero promotes sustainable, prosperous communities. Photo by Julius Reque/Flickr. Travel to New York City and the landscape is much different. A single city block houses a mix of restaurants, office buildings, residences, and shops. This type of development – known as “mixed-use development” – makes it easy to use public transport, walk, or bike, helping to efficiently connect the city’s neighborhoods through sustainable transport. The portion of commuters relying on cars in the city fell from 90% to 59% between 2010 and 2011. These two cities showcase an emerging urban design lesson: Sprawling cities decrease quality of life; compact, mixed-use developments yield economic and social benefits. The proliferation of zoning at the beginning of the 20th century contributed to sprawling cities around the world. Residential neighborhoods sprouted on the urban periphery and in suburbs, giving rise to car-dependent commuter towns. City centers languished, shopping malls replaced commercial streets, and the urban poor were segregated from the wealthy elite. These sprawling cities are increasingly common in developing nations. For example, Mexico’s history of dispersion created thousands of single-family houses on the outskirts of cities. The sheer distance to everyday destinations means some families spend 25% of their income on transport. This type of design increased Mexico City’s greenhouse gas (GHG) emissions by up to 70% and costs USD 2.5 billion (33 billion pesos) each year in lost economic productivity. Mixed-use development works against these trends to create inclusive, connected communities. In mixed-use areas, you can find housing, restaurants, services, schools, cultural facilities, parks, and more. This connectivity reduces the need for private vehicles, thus increasing the viability of public transport, walking, and bicycling. For example, Mexico City’s longest street, Avenida Insurgentes, is home to a range of services, residences, and businesses, but traffic congestion initially made the street difficult to access. For these reasons, Insurgentes was chosen as the site for the city’s first bus rapid transit (BRT) system, Metrobús. After the launch of Metrobús in 2005, 100,000 daily car trips were replaced by sustainable transport, easing congestion and reducing the city’s GHG emissions by hundreds of thousands of tons. It’s a powerful example of how mixed-use development supports and attracts sustainable transport, bringing significant benefits for urbanites. Everyday needs should be close enough to residential neighborhoods that they can be reached by walking, bicycling, or public transport. Graphic by EMBARQ. By reducing the need for vehicle travel, mixed-use development also brings shared community space. Plazas, parks, and sidewalks foster interaction among community members – interaction that wouldn’t be safe or possible under a sprawled, car-centric design model. One landmark study of San Francisco compared three neighborhoods identical except for the levels of vehicle traffic on their streets. It revealed that residents of the neighborhood with the lowest level of car traffic had three times as many friends and twice as many acquaintances as their more heavily trafficked counterparts. Finally, mixed-use, public transit-friendly neighborhoods benefit local economies. They save individuals money on transportation by reducing the length and number of everyday trips and eliminating the need for car ownership. Mixed-use development also supports local businesses by increasing foot traffic. Transport for London found that pedestrians spend up to 60% more money at businesses each month than those traveling by car, while spending less on transportation. 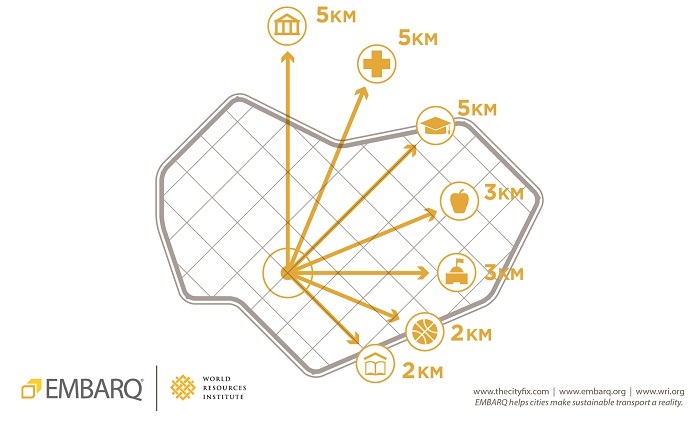 Combining mixed-use development with pedestrianization reinforces these benefits. Human-scale neighborhoods encourage different activities and social interaction, recreating the streets and sidewalks as viable public spaces. Graphic by EMBARQ. According to the World Health Organization, cities will hold 70% of the world’s population by 2050. About 96%of this growth will occur in developing countries, demanding quality urban spaces and services. As current cities expand and new ones crop up, it’s important for local leaders, urban planners, and citizens to examine what works. Compact, car-light cities spur economic growth, social cohesion, and quality of life. Stay tuned for the next entry in the “People-oriented Cities” series, which will address the role of vehicle demand management in effective transit-oriented development. 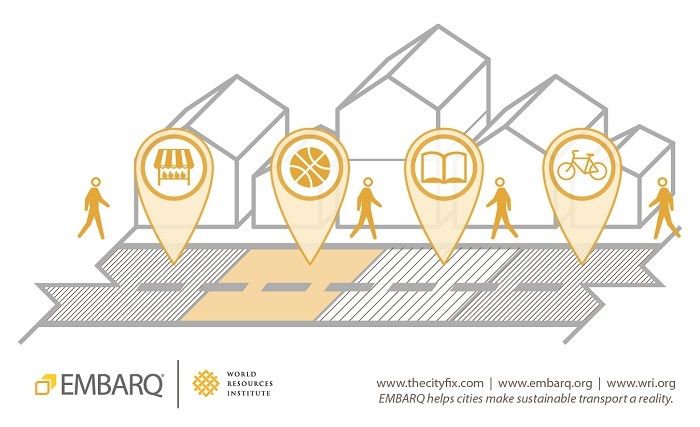 For more on the transit-oriented development paradigm, download EMBARQ’s Transit-oriented Development Guide for Urban Communities. Editor’s note: The original version of this post depicted Mumbai, India as a sprawling city. After careful review, our researchers determined this was an imprecise depiction, and the example has been replaced with Atlanta.